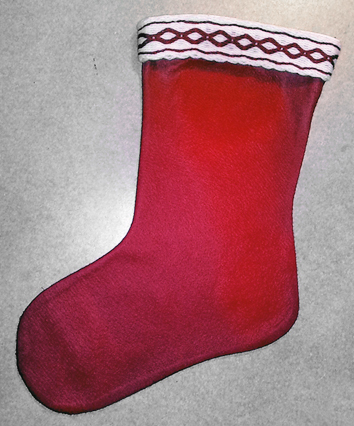 Two people in my family don’t have their own Christmas socks, so I decided to make a couple. The fabric is red felt, and the band that goes around the top is homemade card weaving band. I used the one of the patterns from Eqos gallery. This is the Joyseech pattern, 18 cards. I made sure to make it big enough to get a big hand inside, so that it will fit both candy, oranges etc. Click on the photo for a bigger version. Siden to av familiemedlemmene manglet julestrømpe, bestemte jeg meg for å gi dem dette i julegave. Strømpen er laget i julerød ullfilt og sydd sammen på vrangen. Båndet på toppen er brikkevevd etter Eqos’ oppskrift Joyseech pattern. Jeg lagde en hempe øverst på ‘hælsida’ så strømpen kan henges på en knagg.